Funny you should mention them...paging JaM71...heres his rtt on the left and mine on the right. 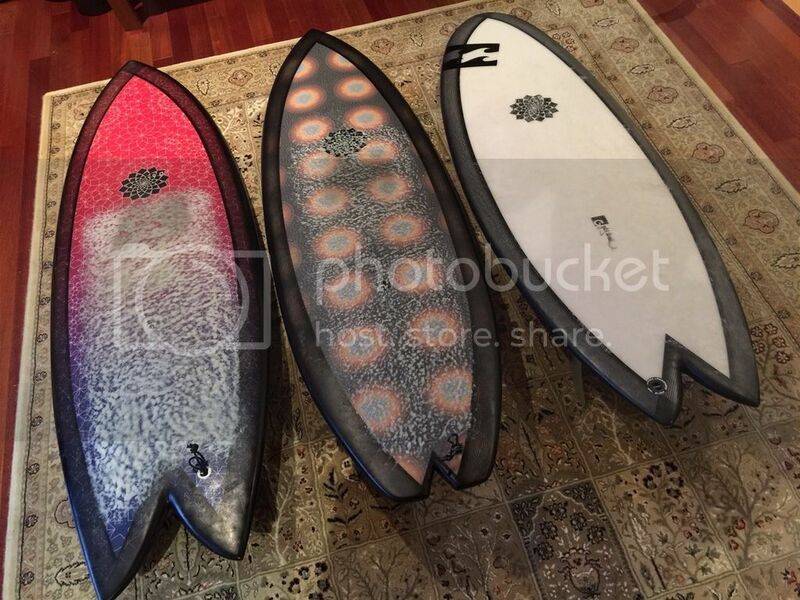 Here's a shot of JaM71's McNeill quiver: left to right Rasta torus twin, CV2, CV1. I got my tt just over 12 months ago & love it. there is a channel running thru The bottom which when u hit a certain speed u get lift & The board feels like its hovering whilst u are hurtling. Its a truly high performance fish nothing like The retro keel fish. I use aipas fins because they are a thinner tipped upright fin, great for beachies. For points or faster waves keels work well, u can draw out your turns more & get more drive down The line. Finally i just picked Up a second Hand cv1 which rasta had been riding over the summer, havent had a chance to ride it yet but it feels like an awesome little pocket Rocket. They ré primarily a groveller/mini simmons alternative. There's a quiver i'd like to ride! I had an alien a few years back that was magic - damn shame it snapped. Except I bought a Rich Pavel keel fin today. 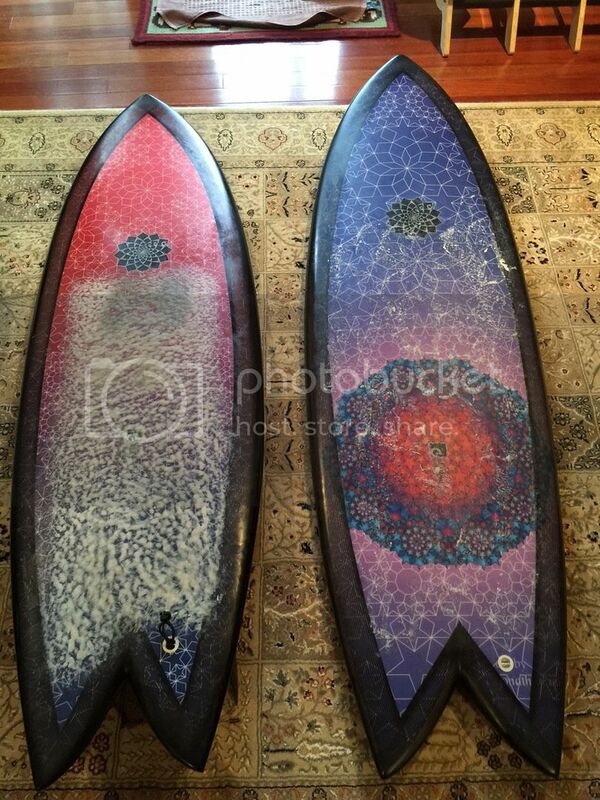 Rare boards - did you do a dirty bad thing and go to Deus? It is a deus one, but i bought it second hand, never been surfed. Price too good not to..
That rasta tourus twin though... Reckon it could be a better option. Drailed wrote: It is a deus one, but i bought it second hand, never been surfed. Price too good not to.. Purchased at a barber shop? He makes a sick keel fish - keen to hear how it goes. I would love a tourus twin too. Can't decide between that or a mackie fish. Nah, gumtree. Took it out this arvo, worst waves ever but it made a couple of average runners seem fun. Think it could prove to be a little magic carpet. Too fast, wow, that would have to be quick. Nah I think the board was just to good for his skill level. Have a fondle of one, they are quite sleek. I covet a quad version but I'll have to sell something on before hand and I'm not sure Sydney would be good for those boards in any event. Might grab a Lost V3 Round It next. AAAhhh ok, funny you mention that cos when talking to a mate of mine (good surfer) he said they are "small mans boards" which in hindsight prob meant "They are too refined for your skill level, look elsewhere"
On second thought I think the guy had a Wonder Boy model. I reckon Gary McNeil would make anyone a board to suit, I've had better boards for better surfers "softened" up before without to much compromise. I like the look of that Pavel. Did you see it on the gumtree? Yeah pretty stoked with it, considering I paid a touch over half price and it still had the price tag on it! Tea tree oil for sticker removal. Aldi. The entity (Alien when Formula energy) are too refined for this old guy. That's why I went with a rtt. Hey even an average Joe like Benny from Board compare liked the rtt and really liked the entity so can't be all bad.